©2012 R.L. 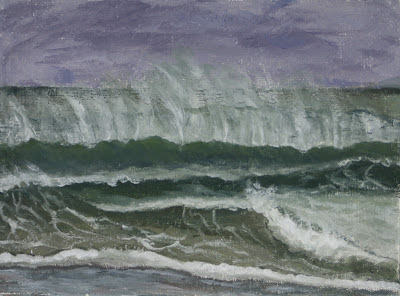 Delight, Incoming Storm: Wavestudy-7, 6"x8", oil on hemp canvas. You can here it coming. There is a sharp slightly muffled crack and then, sudden silence. You become aware of a growing hissing sound. When you are around the sea a lot, you can recognize what is about to hit you if you don't move without even looking up, but of course you look up. It is important to judge the distance and speed of the incoming sneaker wave and make a lightning fast decision as to whether or not you need to get out of the way. Even immersed deep in painting I know the sound and it yanks me out of whatever state I have fallen into. I knew when I arrived at my painting spot this morning that the tide was still coming in. I also could see the beginning of the storm that was forecasted had arrived. I set up about a foot below the last high tide line. The high tide line was on the rocks otherwise I would have set up further back. I could tell I had several hours before I had to worry about being underwater. I forgot about the storm surge though. The waves were breathtaking. The spindrift from a surprisingly warm east wind easily rose eight feet above the crest of the waves. I was a good two hours into my plein air painting when the sneaker wave brought me back to my immediate surroundings. I could tell that it was going to reach my spot and I had seconds to move. I grabbed my tripod with my pochade box and jumped up on the rocks where my pack and gear had been stowed, above the last high tide line. I held my breath and watched as the wave boiled up to literally within an inch away from my pack. 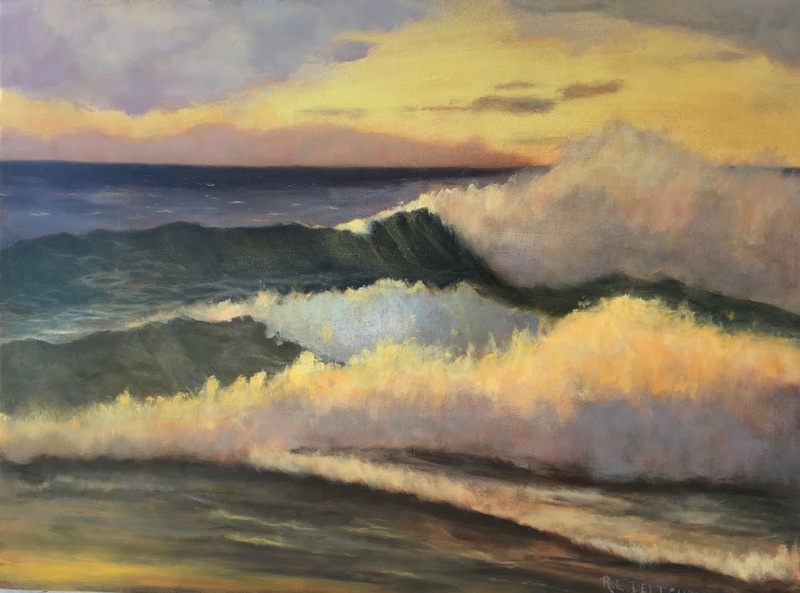 It was a good thing as the sneaker wave brought to my attention that the waves I was studying so intently had actually increased in size and the first drops of the rain were beginning to fall. The wind was also beginning to shift around from the east to suddenly gusting from the south. I took another 10 minutes to get enough information to finish the painting in the studio and quickly packed up and got home. It was a glorious morning! If the above description sounds dramatic it was because the ocean was very dramatic today. I only had the seagulls and a lone raven for company while painting this morning. The painting was done half from plein air and half from memory in the studio. I stopped taking my camera down with me so I wouldn't be tempted to paint from a photo. I have nothing against painting from photos but I realize that I really prefer to paint from life. I like living the painting. Tomorrow will probably be a studio day if the weather reports hold true. Can you tell that I am having a tremendous amount of fun?